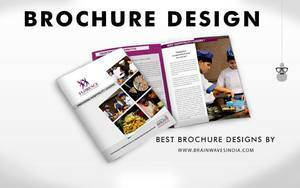 Brainwaves – Trusted graphic designers for purposefully-designed and targeted brochures for your business. We treat brochure design as an art and consider various factors such as conceptual layout, impressive content, size and formatting variants and appropriate colours to make it not just a coloured paper, but a mirror of your work. Contact us now on (+91) 99798 66246 and fix the appointment.